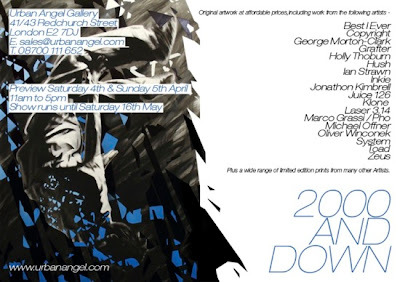 Urban Angel/The Art Lounge opens today the 4th April with their latest show titled "2000 and down". The show will feature original artworks and a wide range of limited edition prints all of which will be on sale for £2000 or less. Featured artist include Klone, Best I Ever, Copyright. Grafter, Inkie, Hush, Zeus to name a few. Preview Saturday 4th April 11am to 5pm with the show running until the 16 May.